When Grandpap teaches Charlie how to plant watermelon seeds in the spring, Charlie hopes they’ll grow a "Wishing Watermelon." Grandpap has never heard of such a thing, and when he asks Charlie what he would wish for, Charlie won't tell. 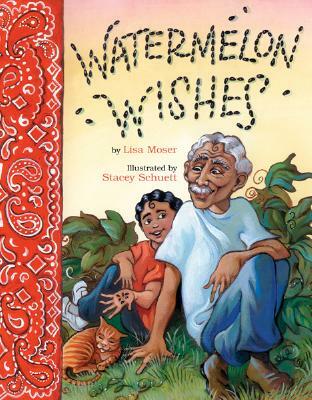 Through a whole summer of biking, fishing, basketball, and waiting for watermelons together, Grandpap tries to guess his grandson's harvest wish. Lush, vivid paintings evoke the friendship, teamwork, and affection between grandfather and grandson as they share their wisdom and this special summer together. Lisa Moser has always loved to read and write. This is the second book she's written for young people, and she always has a stack of at least ten books waiting to be read. Lisa graduated from the University of Iowa with a degree in elementary education, and she used to teach fifth grade in Ohio. This is her first book for Clarion. Stacey Schuett has illustrated many books for children, including America Is ... by Louise Borden (Margaret K. McElderry) and her own Somewhere in the World Right Now (Knopf). She has received two Parents' Choice awards—a Silver Honor for Alex and the Wednesday Chess Club by Janet S. Wong (Margaret K. McElderry) and a Gold Award for Pleasing the Ghost by Sharon Creech (HarperCollins).